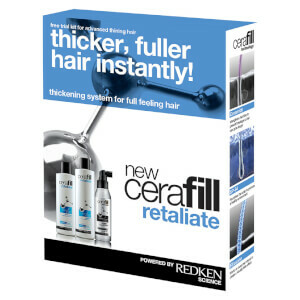 Achieve full-bodied locks with the Cerafill Maximize Dense Fx Hair Diameter Thickening Treatment from Redken. Safe to use on color treated tresses, the formula works to boost and nourish hair. Enriched with Filloxane, the thickening spray visibly plumps each strand to deliver an increase in body and volume; giving the illusion of more hair. The treatment also strengthens the fiber due to Ceramide, which helps to prevent breakages. Expect enviably thick and healthy hair. Apply to hair beginning at scalp in sections. Massage gently at the roots. Do not rinse. Style as usual. 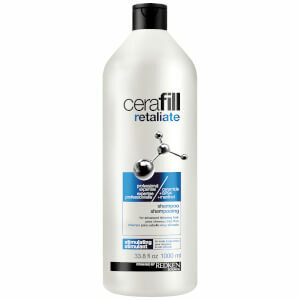 For optimal results, reapply once hair is 60-80% dry. Aqua/Water, Alcohol Denat., Pvp, Propylene Glycol, Phenoxyethanol, Polyacrylate-3, Oleth-20, Triethanolamine, Methylparaben, Parfum/Fragrance, Oleth-10, Menthol, Benzyl Alcohol, Limonene, Linalool, 2-Oleamido-1, 3-Octadecanediol, Aminopropyl Triethoxysilane, Safflower Glucoside, Geraniol Us Pat./ Brevet Americain: 5, 618,523;7,763,587 (D165165/1).